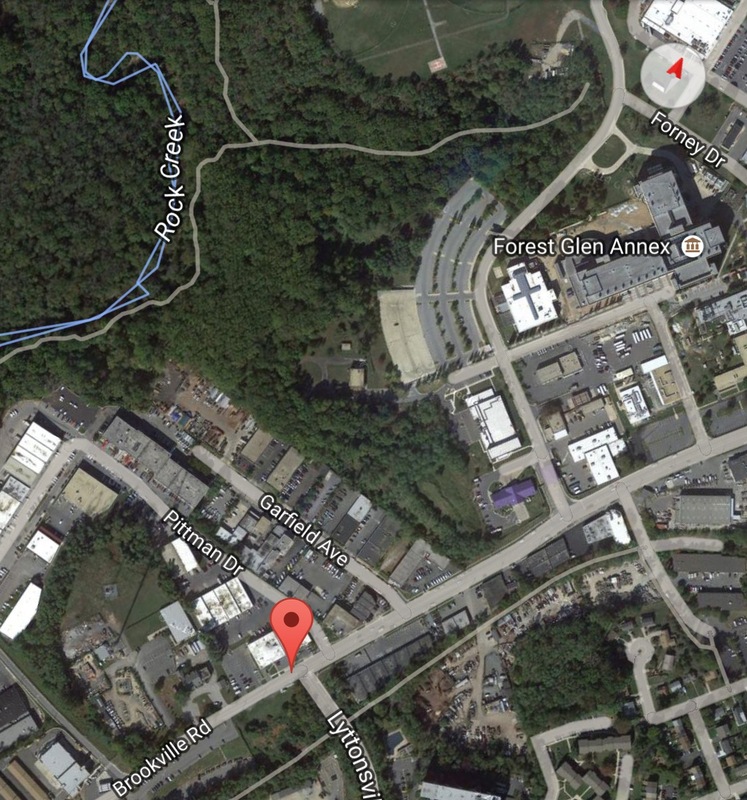 Last week FFG reported on MoCo’s decision to merge the Forest Glen and Montgomery Hills Master Plans as MoCo envisions economic revitalization for both areas. 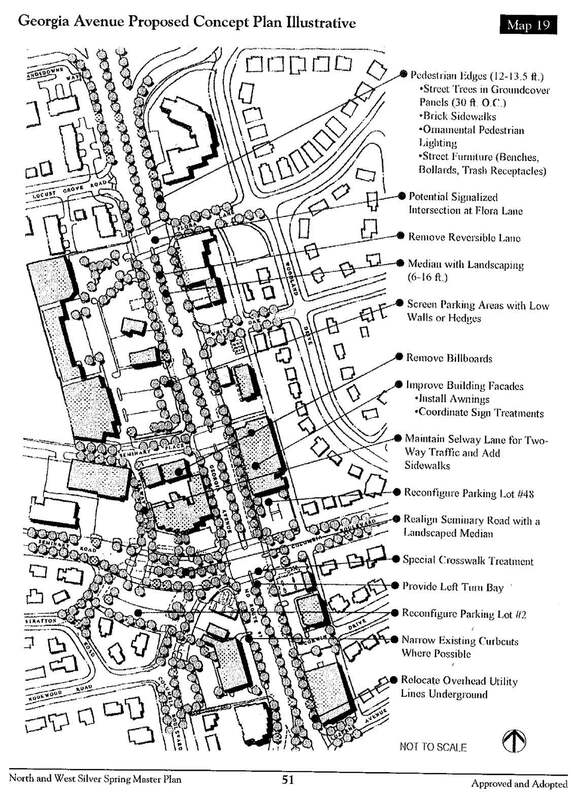 But what if this Master Plan included a 2nd Forest Glen Metro entrance on the southern side of Georgia Avenue at Montgomery Hills? 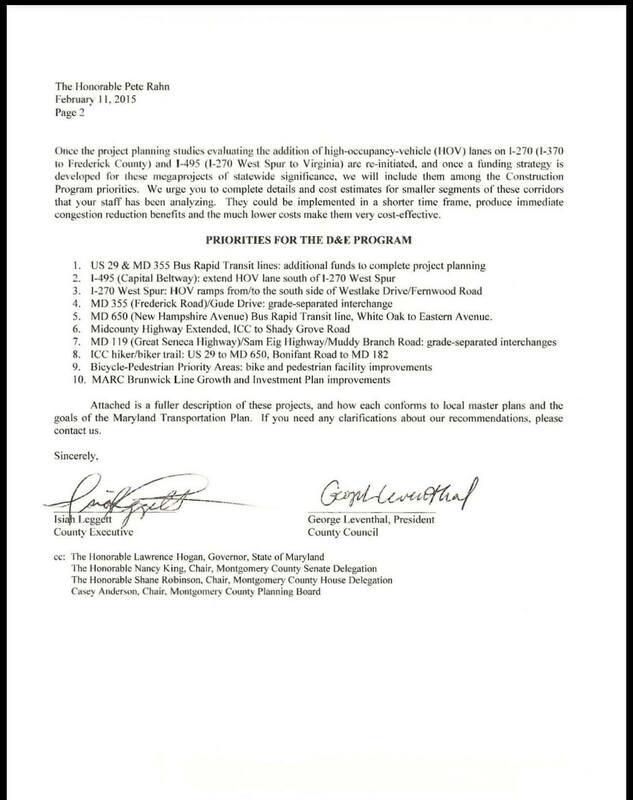 According to MoCo – there is space at the end of the metro platform for a such a tunnel extension. WMATA already owns land right next to the historic shopping center where the current FG Metro’s power station resides (pictured below). If FG and Montgomery Hills develop as the Master Plan suggests, the roughly 25-acre combined area could be rebranded as a mini-city. 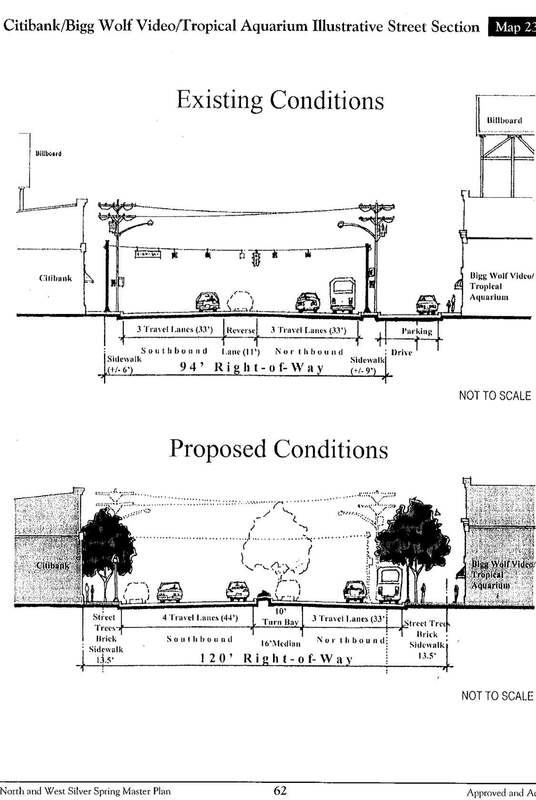 Could a second FG metro entrance connect the two areas in a way that the Georgia Ave Pedestrian Bridge developers could ever imagine? 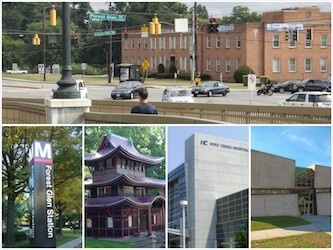 Although there are plenty of DC stations that have multiple entrances such as Dupont Circle or U-Street, there are also a few suburban stations that have multiple entrances such as the White Flint Metro Station in Rockville (pictured below). The Georgia Ave Pedestrian Bridge is useful for crossing over I-495 by foot – but its design, elevation and exposure to the elements often make it cumbersome to use. 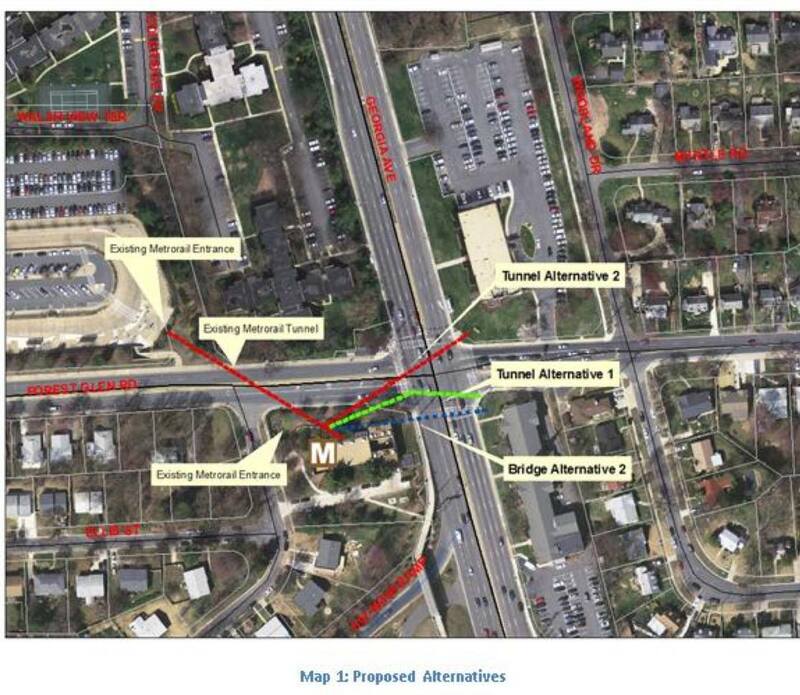 A southern Georgia Avenue metro entrance could prove to be more useful than the currently underutilized pedestrian bridge. 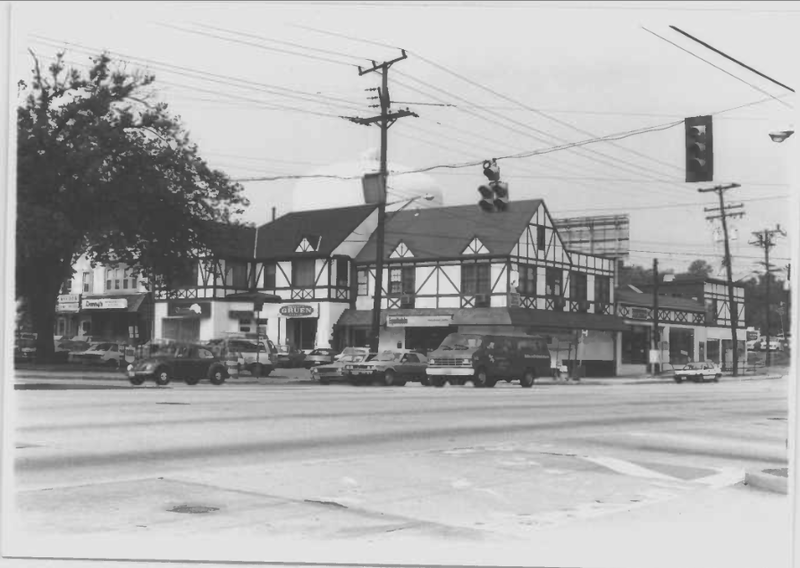 Even though the Montgomery Hills Shopping Center was deemed as a non-historic property in 1987, the tudor revival styled area is one of the largest operating shopping centers in MoCo that has retained its original architectural features. 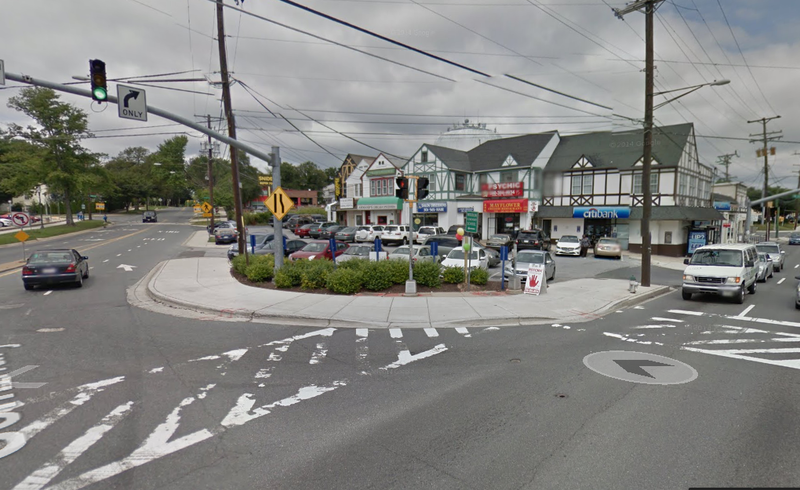 As Silver Spring began to grow in the 1910s and 1920s, corner grocery stores began to appear in suburban areas where these kind of developments were isolated as commercial structures in mostly residential neighborhoods. 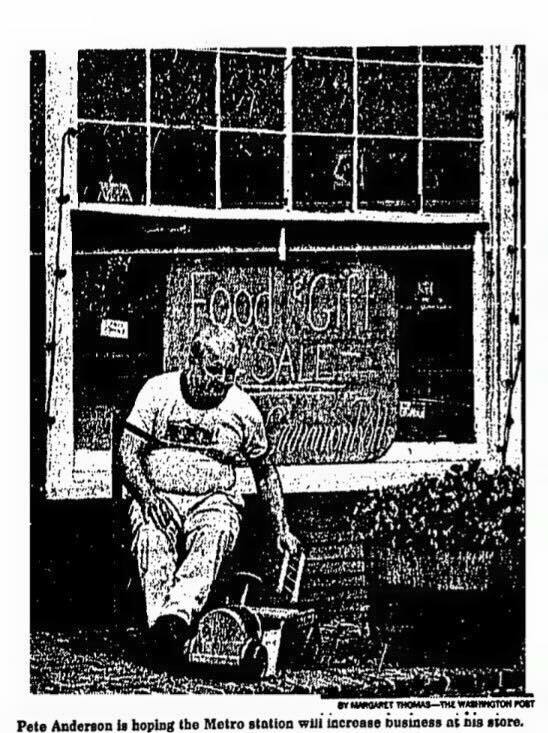 Communities such as Chevy Chase deliberately banned commercial development as they were unfitting to the prestigious nature of its residential neighborhoods. Recognizing that such shopping facilities were inevitable, a few forward-minded developers took it upon themselves to design and build a block of stores in areas deemed for commercial use (pictured below a 1987 photograph of Montgomery Hills). Plagued by traffic and congestion, a new FG metro entrance could breathe life into this once thriving neighborhood shopping center and create a new urban oasis nestled between downtown Silver Spring and Wheaton. If the new FG/Montgomery Hills consolidated Master Plan materializes along with new transit friendly mix-used development, Silver Spring could add another revitalized neighborhood with a rich history to its list. Now the hard part is coming up with a name – FG Hills anyone? 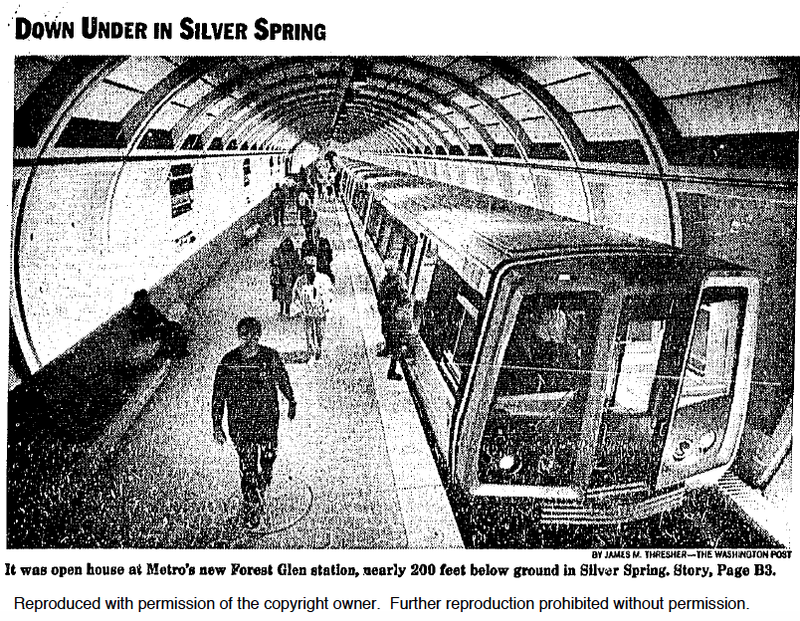 Not much has changed from this 1990 Washington Post article covering the opening of the Forest Glen Metro. Today – opponents of the Purple Line have similar “NIMBY – Not in my backyard” views. 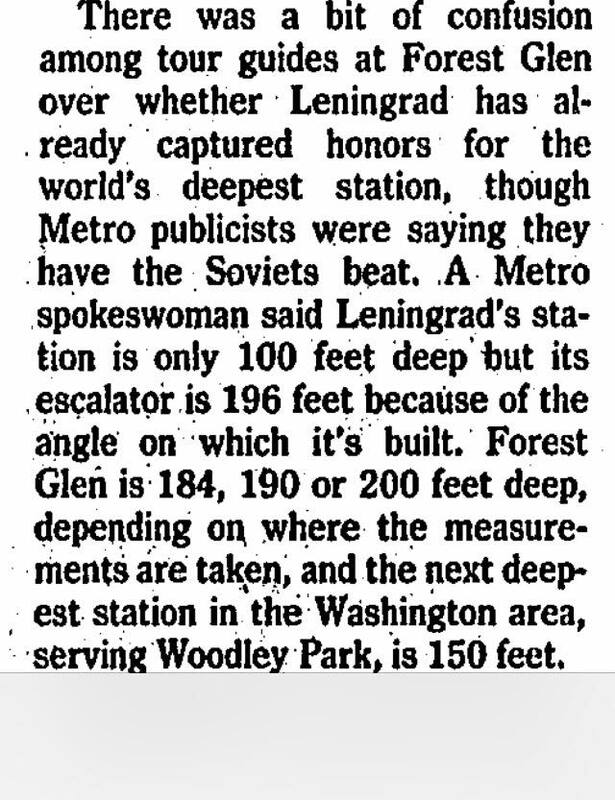 Interesting tidbits – the discussion on whether the FG metro is the deepest in the world is amusing (we know this isn’t the case thanks to the advent of the Internet but it does appear to be the deepest in the U.S. from what I can see!). Also average home values in FG have gone up to around $450-500k from $190k in 1990! Governor Hogan is reportedly making his final decision this month on whether to support (and fund) the proposed Purple Line. As we await that decision, let’s take a moment to consider what kind of impact this project will have on the Forest Glen area. 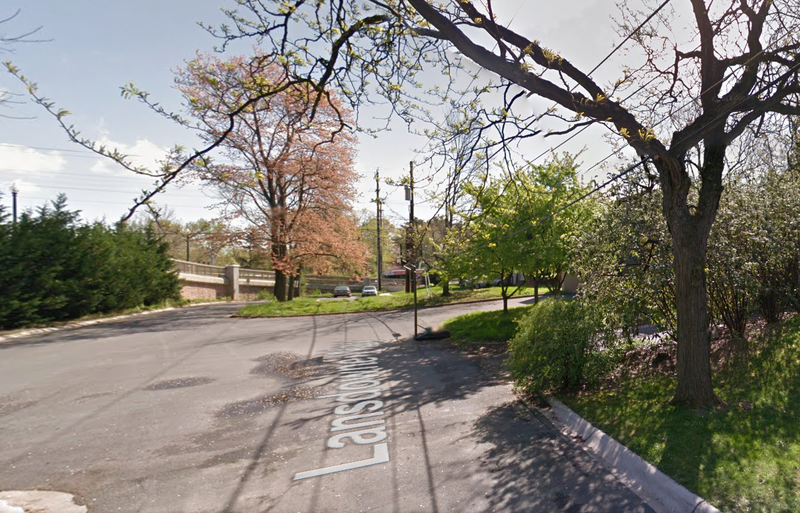 The closest station to Forest Glen will be the Lyttonsville stop on the east side of the Lyttonsville Place Bridge. For most, this is a 15-20 min walk, and will effortlessly connect Forest Glen residents to the University of Maryland and Bethesda. 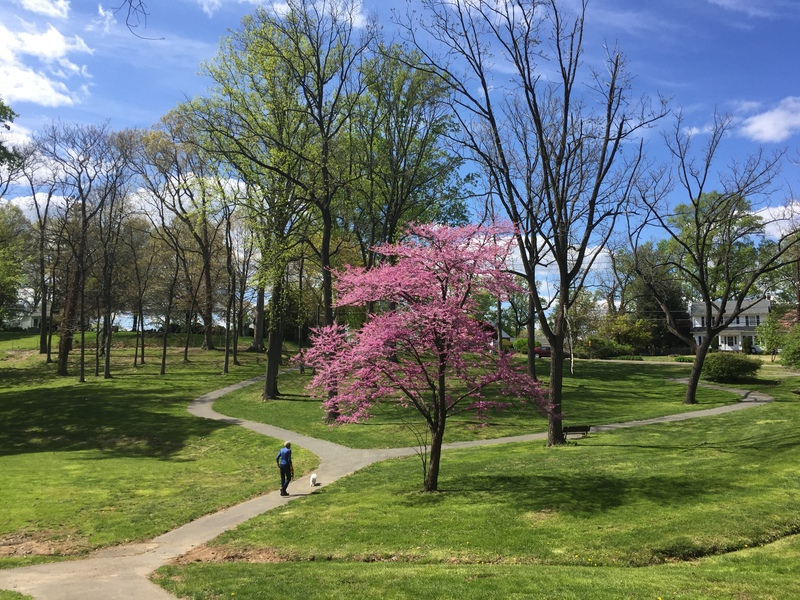 The Purple Line will also connect the Army’s 138-acre Forest Glen Annex to the rest of the WMATA metro network. 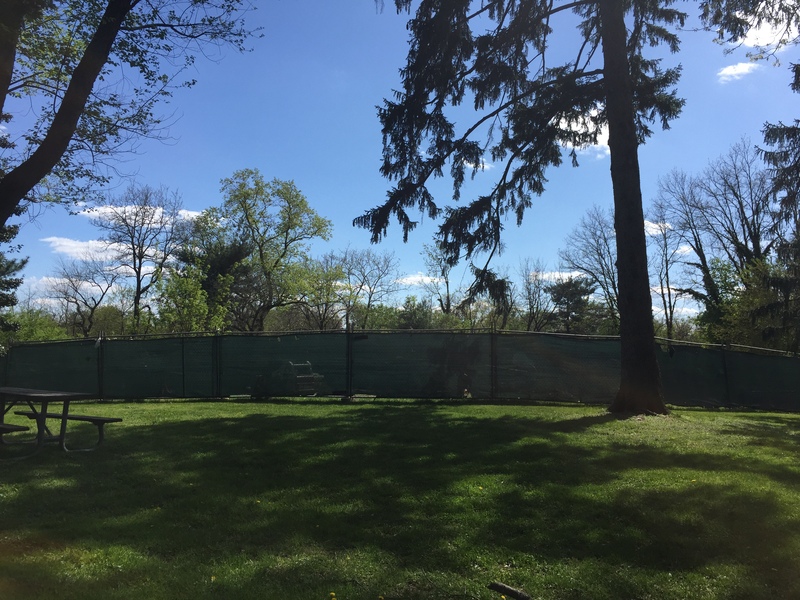 Tucked away next to Rock Creek Park along Linden Lane and Brookville Road, the installation is home to the Walter Reed Army Institute of Research and the Naval Medical Research Center. Both institutions are known for some of their recent HIV and Ebola research. 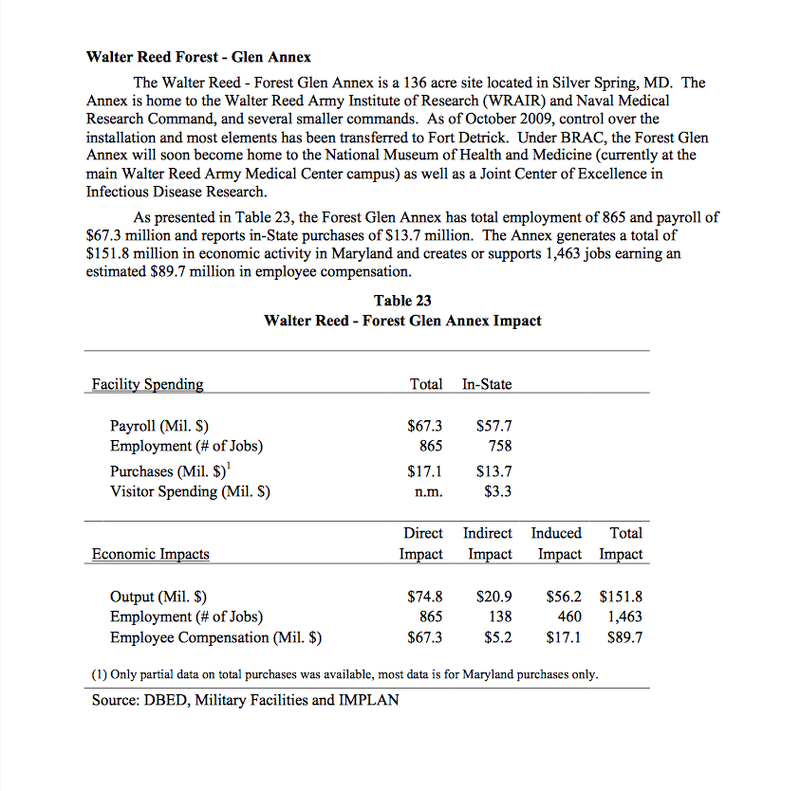 Furthermore, a recently commissioned study by Maryland’s Department of Business and Economic Development estimates that the Forest Glen Annex generates upwards of $150 million of annual economic activity and supports nearly 1,500 jobs. A station near this installation would not only alleviate some of the installation’s traffic woes, but could also be a catalyst for other types of economic development and public-private partnerships which support the institutions’ research. 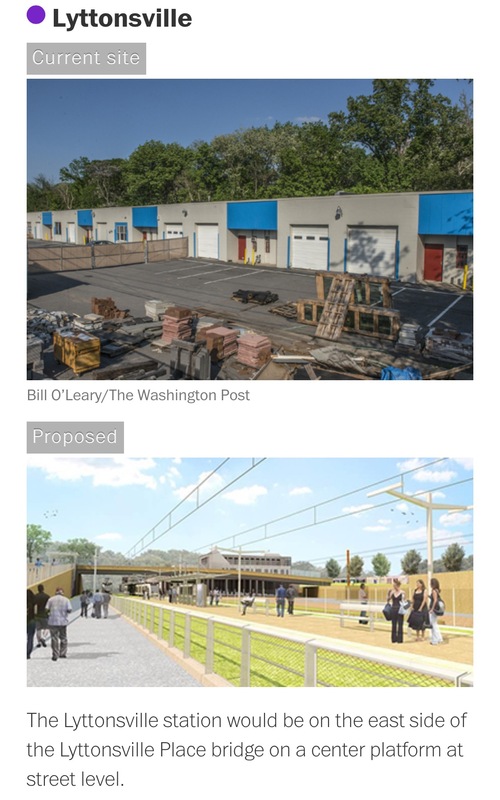 There are certainly plenty of vacant parking lots and empty warehouses around the Purple Line’s proposed Lyttonsville Place stop for this kind of development as well as other types of positive community development we tend to see supported by reliable rail transit centers. Let your voice be heard today and click on the link below to send a supporting email to Gov. Hogan’s office! 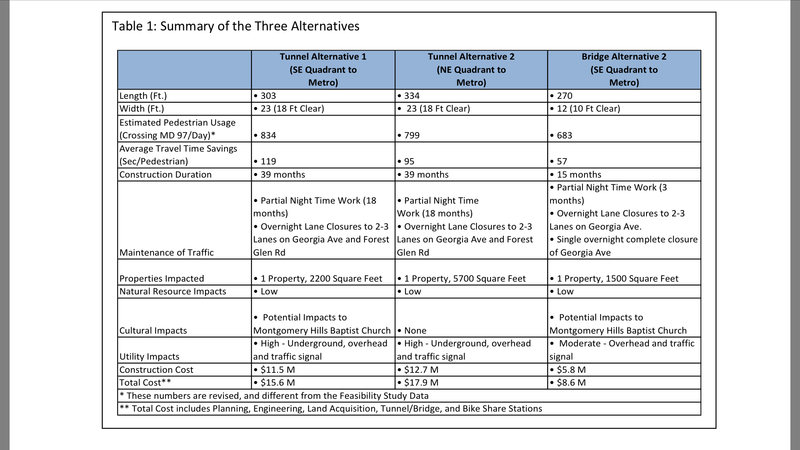 This will likely require developers to fund the pedestrian tunnel (which may cost as high as $ 17 million) and further access improvements that may include sidewalks, bike lanes and a dedicated left turning lane. 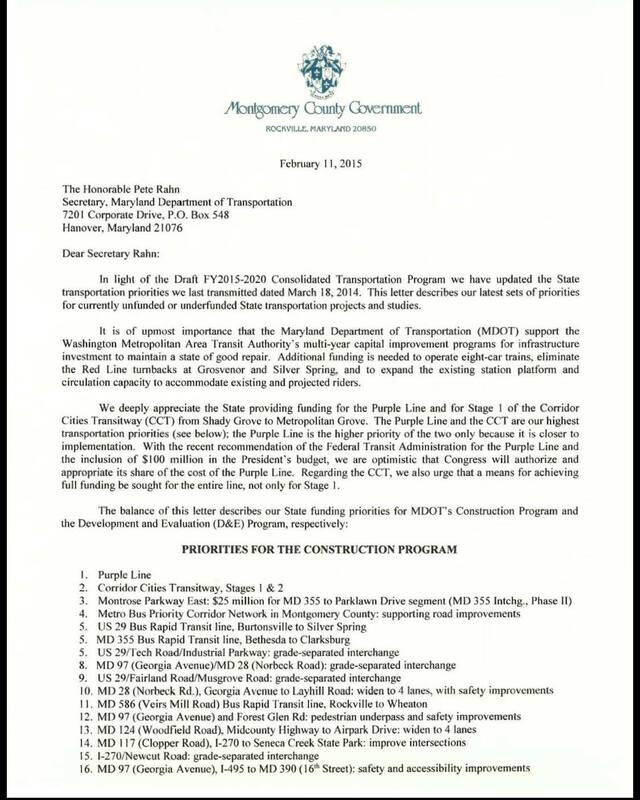 Call or email your State Delegate to let them know you want this project funded! Some recent pics of the Forest Glen Neighborhood Park. Construction is underway on this gorgeous day! 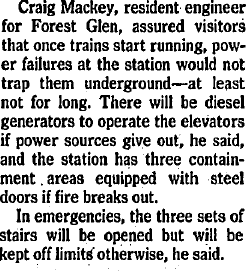 On September 22, 1990, the Forest Glen Metro opened to the public with great anticipation with much curiosity on the high-speed elevators that drop customers to almost 200 feet. Many customers were rightly concerned about being stuck in the elevators during a power failure. Good to know WMATA has a back-up plan!